White sneakers are nothing new. Adidas, K-Swiss, Keds...they've been around forever. 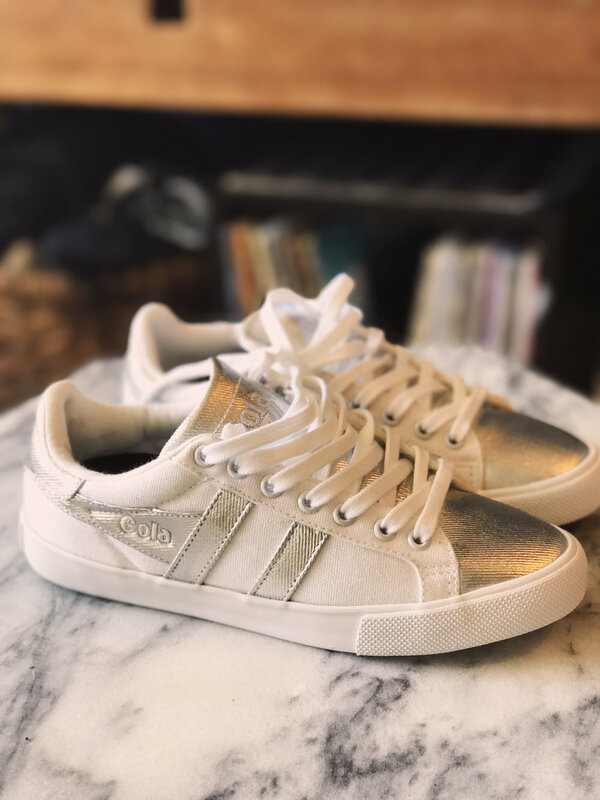 In recent seasons however the trend has not been bright white sneakers but rather roughed-up, worn for years, been-around-the-block sneakers. I first starting seeing this look on one of my favorite style blogs, Sincerely Jules. Her go-to brand was and still is, Golden Goose. I immediately looked up the style, eager to get a pair for myself. Then I realized how much these beat-up sneakers retail for - $450 and up! For dirty, worn-looking sneakers!? I was crushed. Of course it only made me want a pair more. While looking for alternatives the cheaper, cleaner versions just looked even more passe now that I had my heart set on the Golden Goose look. I just could not bring myself to spend $500 on sneakers. Heels, yes. Sneakers, no. So what's a girl to do? If you're Emily Farina you set out to re-create the look for less. I know what some of you may be thinking - regardless of the price isn't intentionally dirtying sneakers fundamentally...stupid? Or, as some publications have voiced - isn't this appropriating attire of the homeless and down-trodden? Well, the answer to both questions may be yes. But it didn't change the fact that I had to have a pair of beat up white sneaks. The heart wants what the heart wants! The first step is actually getting a pair of white sneakers to beat up. I purchased mine from ASOS and while the exact pair is no longer available, they have a bunch of similar options (here, here, here) that would work equally well. Pull on the laces to loosen them up. The look you're after is nonchalance, straight-laced is quite literally the antithesis of this style. Grab some black shoe polish. Yes, shoe polish. With a rag or sponge, use the polish to add "scuffs" around the sole and anywhere a shoe would naturally get beat up. Really get into it and don't forget about the laces! That's it! It's so easy. If you really want to commit to achieving the GG look there is only final addition. What makes Golden Goose such a fashion favorite is that they have a small hidden wedge within the sole of the sneaker. That means they the wearer gets just a little lift to make their legs look longer, leaner and just all around better. Brilliant right? Well I figured out a solution for that - wedge inserts. Yes this is a thing! There are a bunch of different brands that sell them but I went for the cheapest version on Amazon. You simply slip them into your shoes and you get a lift, all the while no one is the wiser. And the best part, you can easily remove these inserts and put them into any other shoes you own. Money idea right there. 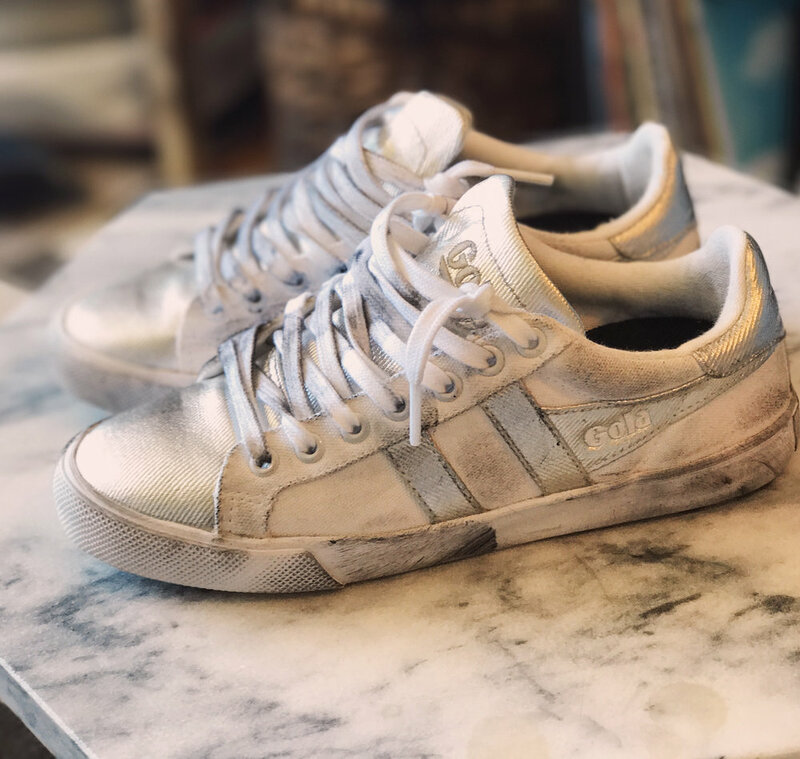 So that's it, all you need to recreate the look of Golden Goose sneakers. Take that $500 you're saving and invest in some classic pumps - just sayin'.